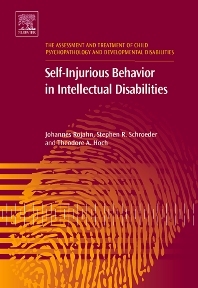 Self-Injurious Behavior in Intellectual Disabilities gives a broad overview of the literature in the area of self-injurious behavior in people with intellectual disabilities, but most of the text is dedicated to the review of the behavioral and biological research in this field. In fact, it is our view that the most promising heuristic approach for the advancement of our understanding of this phenomenon and for its management and treatment is likely the bio-behavioral perspective in which behavior can be studied at the intersect of learning and the biological bases of behavior. We propose an overarching heuristic model, which we call the Gene-Brain-Behavior Model of Self-Injurious Behavior that presents a platform to integrate disparate, and previously isolated scientific approaches.